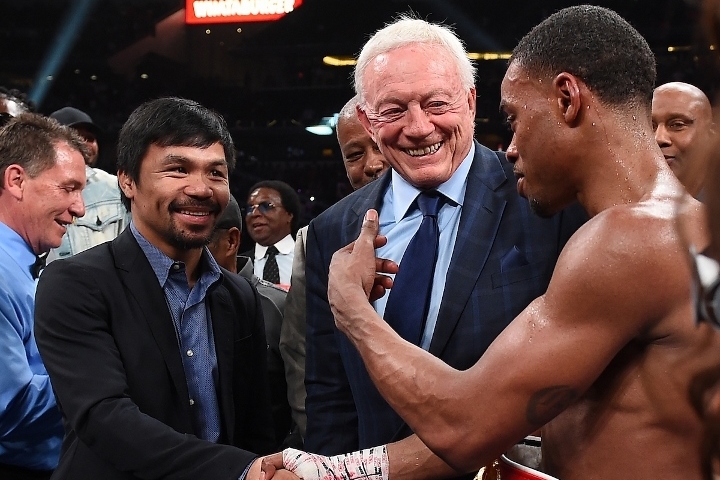 This past Saturday night, Errol Spence called out Manny Pacquiao after a dominant victory against Mikey Garcia to retain his welterweight world title at AT&T Stadium in Arlington, Texas. Spence held onto his IBF belt and picked up the vacant WBC diamond welterweight strap courtesy of a lopsided unanimous decision against Garcia. The judges in Texas, and observers, saw a one-sided fight with tallies of 120-107, 120-108 and 120-108. WBC lightweight title-holder Garcia, already a four-weight world champion, stepped up two divisions to tackle Spence and the difference was clear for all to see, as Spence's superior strength, size and reach handed the 31-year-old (39-1) the first defeat of his career. Spence, who improved to 25-0, was joined in the ring by Pacquiao after his victory, amid suggestions a bout between the pair could take place in July. After a restrained, probing start to the contest, 29-year-old Spence began to assert himself in the fourth and fifth rounds, with a left to Garcia's impressive chin among the highlights. Referee Jon Schorle briefly considered halting the fight as Spence punished Garcia in the 11th, but the challenger somehow remained on his feet to delay the inevitable until the final bell. Spence believes the fight is perfect right now, since Pacquiao is only a few fights away from retirement. Both boxers feel ready to collide in July. "He just beat Adrien Broner on pay-per-view. He actually holds the record for the most tickets sold at AT&T Stadium. I feel like it only makes sense to face Manny Pacquiao, back at the AT&T Stadium, and break his record and maybe have 70,000 seats filled. I'm putting on my promoter's hat now," Spence said. As far a dream fight with Floyd Mayweather, Spence doesn't see that happening. "Floyd is retired. I actually spoke to Floyd and he said that he doesn't have any ambitions of coming back," Spence said.